Lowell Howard with Scioto County superintendents. 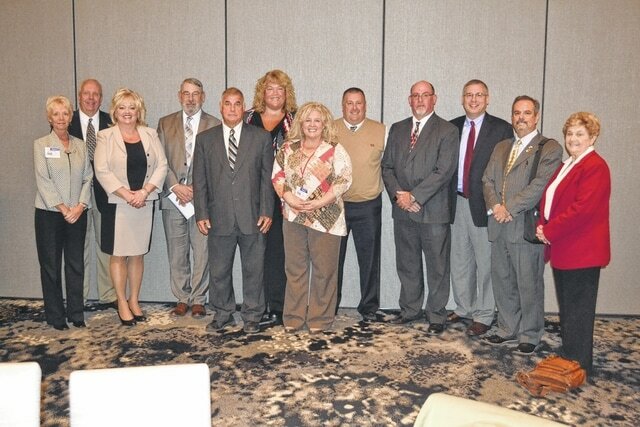 Pictured (left to right) is Barb Dever (Minford), Tony Mantell (Clay), Sandy Mers (South Central Ohio ESC), Mark Shreve (Manchester), Lowell Howard, Melinda Burnside (New Boston), Jodi Armstrong (Green), Todd Jenkins (Northwest), Jeff Stricklett (Washington-Nile), Mark Knapp (Wheelersburg), Stan Jennings (Career Technical Center), and Patricia Ciraso (Southern Ohio Academy). Former South Central Ohio Educational Service Center (ESC) Superintendent Lowell Howard was given the prestigious Lifetime Achievement Award on Nov. 9, 2015, during the 30th Annual Ohio ESC Association Capital Conference Awards in Columbus, Ohio. Howard began in his career as a social studies teacher at New Boston High School in 1970, later becoming principal and then superintendent. He retired from New Boston School in 2001 but continued serving districts in an interim capacity. He worked at Eastern Local, Rock Hill Local, and Manchester Local schools, and in 2007 he came out of retirement to become superintendent of the South Central Ohio ESC. Howard retired from the South Central Ohio ESC in July of 2015, ending more than 40 years in public education. He was nominated for the Lifetime Achievement award by current South Central Ohio ESC Superintendent Sandy Mers, and his nomination was supported by every superintendent from every school district in Scioto County. Howard received the award during the Capital Conference Banquet in Columbus on Nov. 9, 2015, surrounded by his family, South Central Ohio ESC employees and board members, and Scioto County superintendents. “I’m humbled to receive such an award. I really think the award is symbolic of all the people I’ve worked with. I’ve been so fortunate to have a superb board of education, a superb staff, and great support from all my employees during that tenure. It’s really humbling to receive such and award, but everyone contributed to any success the ESC has had,” Howard said. He said the large turnout of support at the awards banquet is evidence of the support and teamwork of the South Central Ohio ESC. After offering her congratulations, Mers said Howard is most deserving of the awards. “He is the epitome of educational service. He is centered on kids, promoting their achievement and helping everybody else,” Mers said. Now retired for a second time, Howard said he looks forward to traveling across America with his family. Over the past 30 years, the Ohio ESC Association has recognized nearly 1,100 board members, educators, and community leaders during its annual Capital Conference Awards. For more information about the Ohio ESC Association, visit them online at www.oesca.org<http://www.oesca.org/>. For more information about the South Central Ohio ESC, visit online at www.scoesc.org<http://www.scoesc.org/>, or follow on Facebook and Twitter.